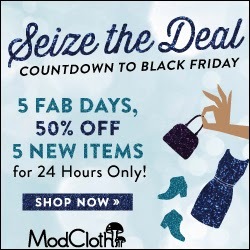 MamaBreak: ModCloth Pre Black Friday Sale!!!! We are going nuts over this pre-Black Friday Sale over at ModCloth. Each day they put 5 new items at 50% off!!! !The shoes today--- to DIE for and only $39.99!!!!!! Links above may be affiliate links. We thank you for supporting MamaBreak.